It’s doubtful whether either Don Reive or Dave Sexton dipped into their ‘Complete Works of Shakespeare’ in search of such emotive prose to inspire their teams ahead of the 1970 FA Cup Final between Leeds United and Chelsea, but given the events in the game that followed and the subsequent replay at Old Trafford some 18 days later, they may well have done so. The game that took place on 11th April has been variously described as barbaric, spectacular and iconic, in not very equal measures. Given the enmity that existed between the two sets of players however, none of that was particularly surprising. Throw in the condition of the supposedly ‘hallowed’ Wembley turf, being turned into something resembling “Goodwin Sands” according to BBC commentator Kenneth Wolstenholme, thanks to the ‘Horse of the year Show’ being held there a few days previously, and you have all the ingredients for a game full of anger, spite and not a little outstanding skill. Like two cage-fighters the teams snarled and spat venom at each other across 120 minutes of normal, and extra-time, at Wembley, then locked down the ire only to release its pent-up force, enhanced by frustration, a couple of weeks later in Manchester. After the first drawn cup final at Wembley, and the first of all time since Barnsley and West Bromwich Albion played out a deadlocked game at Crystal Palace, London in 1912, some 28 million viewers – the second largest television audience of all-time for a sporting event, topped only by the 1966 World Cup Final – were seduced into watching the seething malevolence of the replay. They were rewarded with drama aplenty. For anyone not of sufficient vintage to remember the games, and perhaps also the tone of football around that era, it may be difficult to equate the untrammelled if not unrushed poetry of today’s game with the more prosaic approach that dominated the domestic game of the time and the surfaces upon which they were played out. Such differences were not merely limited to the pitches upon which players were asked to perform, however. Whereas today, the bowling green surfaces and snooker table evenness allow skill and expression, forty-odd years ago, the muddy and ploughed field appearance of pitches were more inclined to invite an agricultural approach. Despite being merely a few months ahead of Joga Bonito’s triumph over Catenaccio in the heat of Mexico City’s Azteca theatre, these were ‘muck and nettles’ games, with no quarter asked or granted. It was very much of its day, but spiced up with a little extra piquancy. Chelsea and Leeds United had history. Both clubs had graduated to the top league of English football in the mid-sixties and had sought to progress their aspirations for silverware. That however was where the similarities largely ended. The differences rubbed up against each other, and with such friction, heat inevitably accrues. Blues striker Ian Hutchison once described the mutual loathing that existed between the clubs. Simply put, he related it as “Hate. We hated them and they hated us.” Footballers these days would be wary of such open declarations, but the Blues’ striker’s remarks hardly surprised anyone. The bad feeling was well-established. With both clubs looking on themselves as the thrusting, up-and-coming club, rivalry was inevitable, but it went beyond that, with the traditional North v South rivalry and all that entailed, adding a bit of social and geographic spice to a pot that was already on the boil. Don Revie had joined the Elland Road club in 1962. A cerebral player, way ahead of his time, while at Manchester City he had developed the role of the ‘deep-lying centre-forward’ pre-dating the tactical innovation of the ‘false number nine’ by Guardiola and Messi in Catalunya by fifty years or so. His team however were dominated by pragmatism and the overriding requirement of getting the results required to progress. To many, seen as the consummate professionals, they would happily eschew entertainment and showboating in favour of a fabled Yorkshire grit. They were uncompromising, unapologetic and successful. It’s not difficult to see how such an approach would have no truck with the perceived southern flash team from London. Chelsea saw themselves very much as the avant garde club; London’s footballing high society, in touch with the zeitgeist. They took their outlook onto the pitch with them, at times entrancing, but only when in the mood to be so, at others moody and nonchalant. They played with a flair and saw themselves very much as the friends of the famous; film stars and the glitterati of the music world were pictured with the players. Chelsea were the only club George Best said he could see himself playing for if he ever left Manchester United. Leeds United, its players and fans looked upon their cup final opponents as the southern dandies, more interested in current fashions then football. The perceived contrast was stark. Chelsea saw Leeds as boring, ill-tempered and nasty. Chelsea had their wine bars and Leeds United had their Revie-inspired games of bingo. And yet these perceived differences hid so many similarities between the sets of players. Although they had different doctrines, both clubs had managers who were considered to be shrewd and forward thinking. Each also had goalkeepers who were at times erratic and at others breath-takingly brilliant; such characteristics would play a full part in deciding who would lift the FA Cup. In defence, there were paired hard-men of the day. 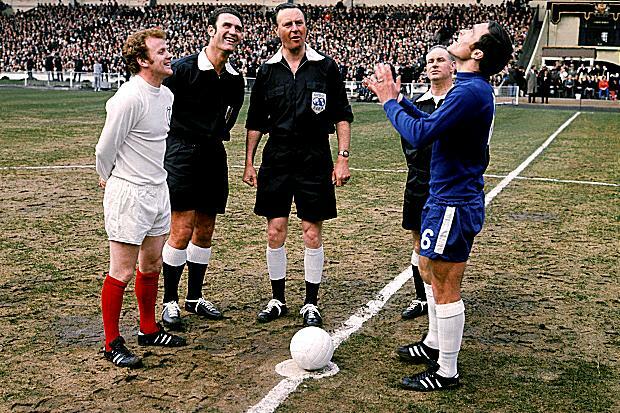 Leeds had Norman ‘Bites Yer Legs’ Hunter, whilst Chelsea had Ron ‘Chopper’ Harris. Each also had a ‘trixy’ Scottish winger. The crouched and studied style of Leeds United’s Eddie Grey disguised a grace and elegance that left many full-backs floundering in his wake, whilst Chelsea had Charlie Cooke, whose dancing feet could take him around three defenders in a telephone box. These contrasts and similarities both fed the mutual dislike of one team for the other and each time they were paired up on the pitch, it was important not only to win the match, but also to demonstrate a macho disregard for the opposition. Since joining the top echelon of English football, the resentment had steadily built but was given an unhealthy boost in the FA Cup semi-final of 1967, when Leeds were denied a late equaliser from a Peter Lorimer free-kick when the referee ordered a retake because the Chelsea wall had encroached inside the designated ten yards. By the time the 1970 FA Cup Final rolled around, both were ready for battle and probably needed no incantations to drive on the dogs of war. The teams that took to the Wembley pitch had finished second and third in the league, although neither were particularly close to runaway champions, Everton. The Yorkshire club trailed The Toffees by nine points, with the London club a further two points back. Neither had ever lifted football’s oldest cup trophy either, although both had come close in recent years. Leeds had lost the final to Liverpool in 1965 and Chelsea to Spurs two years later. Both felt the need to amend that statistic. Earlier in the season, Leeds had twice defeated Chelsea in the league, winning 2-0 at Elland Road and then inflicting a humbling 2-5 result on their unwelcoming hosts at Stamford Bridge. As well as finishing a place ahead of the London team in the table, there was a general feeling that the Yorkshire team were the better team, and unless Chelsea had one of their good days, it would be Revie’s men lifting the cup. There were four goals in the game, and the FA’s own website detailing the game offers a wonderfully sanitised version of the game concentrating on the goals scored and applauding elements of both teams’ performances and resilience. It even makes a passing reference to the condition of the pitch being, “in poor condition – wet, patchy and sanded,” but offers no mention of the reason why – the FA’s drive for financial considerations above those for the game itself is nothing particularly new – or any comments on the muscular and robust tackling that took place throughout the encounter for that matter. Early on, an attempted through ball by Hunter illustrated the peculiarities of the pitch caused by the FA’s financial follies. As it skipped harmlessly through to Peter Bonetti in goal for Chelsea, there was hardly a bounce as it landed and skidded through to the goalkeeper. Such conditions would have a hand in the first goal. A pattern that would persist throughout most of the encounter was set early when Eddie Gray ran at David Webb, covering in an unfamiliar full-back position. The swerving runs of the Scotsman, eluding the robust Webb would be a continuing feature, and often – as on this occasion – Webb was compelled to bring the winger to the floor to halt his progress. The first goal came on 20 minutes from a corner floated in from the right by Lorimer. Jack Charlton had a modus operandi for such occasions. He would stand on the goal-line and when the cross came in, it would be targeted for inside of the six-yard box. If delivered accurately, the tall defender would then simply take a couple of steps back and nod the ball home. The manoeuvre brought him a number of goals throughout his career. Chelsea were of course aware of this and had posted two defenders on the line. When the ball arrived, Charlton completed his party piece, but on any other day, with both Eddie McCreadie and Ron Harris guarding the line, one of them would surely have cleared. The condition of the pitch took a hand however, and reprising its trick from Hunter’s attempted early pass, hardly bounced, and eluded to swinging boots of the defenders, to roll apologetically over the line and come to a halt probably no more than twelve inches past the whitewash. Leeds were ahead, and the blue touch-paper had been lit. The patchy pattern of play dictated by the pitch continued towards the break, as did the robust challenges. In modern times, the number of cards issued would have resembled a birthday celebration, but these were different days and refereeing standards were more, shall we say, tolerant. Just before the break though, that erratic tendency prevalent in the goalkeepers raised its head. Peter Houseman struck a shot from 20 yards or so that bobbled on its way towards Gary Sprake’s far post. It may be generous to the Welsh goalkeeper to suggest that again the pitch played its part, but Sprake merely seemed to dive over the ball as it squirmed past him and into the net for the equaliser. The error would cost the Welshman his place for the reply. After the break, Chelsea appeared invigorated by their equaliser and one passage of play saw the ball bouncing around the Leeds penalty area like some bagatelle game with Sprake trying to collect, defenders trying to hack clear and Chelsea players firing shots that were blocked and deflected. Eventually the ball was spirited away and the scores remained level. Play went on, and as time ticked away, the already short fuses threatened to ignite. Billy Bremner lost possession, but seemed more intent in engaging with Harris in a bit of MMA than chasing the ball. But as play continued uninterrupted, the ball found its way to Gray who swayed past Webb for the umpteenth time before crashing a shot against Bonetti’s bar and away. Both teams were struggling with the strength-sapping conditions of playing on the cloying surface, but Leeds seemed the more dominant and again struck the woodwork when an Allan Clarke header beat Bonetti. Again, the ball bounced clear. The respite was short-lived though as Mick Jones pounced on the ball just inside the area and fired across Bonetti and inside the far post. With just half-a-dozen minutes left to play, it felt like the winning goal, and the Leeds players and fans certainly celebrated like they believed that to be the case. Picking up on the comments on the FA’s website though, Chelsea displayed a resilience that any stereotyping from up north suggested they lacked. They ploughed forward – appropriately on such a surface – in search of an equaliser and with just five minutes to play, Charlton was lured out of the middle to deal with a thrust from Peter Osgood down the Chelsea left flank. Clumsily fouling the front man, he offered a chance for the Blues to loft a cross into the box from the free-kick. John Dempsey and Webb joined Osgood and Ian Hutchinson in the box as Leeds players flooded back to pick up their men. Instead of crossing however, Harris played the ball short to John Hollins, requiring defenders to come forward and close him down. Noticing the resultant gap as defensive allocation began to disperse, the midfielder clipped the ball onto the head of Hutchinson who lunged forward to nod home the equaliser ahead of his marker. Extra-time now seemed inevitable, but there was still time for an extra piece of physical excess. As Hollins attempted to head the ball forwards, John Giles, the beguilingly gifted Leeds playmaker with the stiletto-sharp edge of malice, caught him high across the midriff with, what looked for all the world like, a consciously aimed boot. Hollins was floored understandably. Giles was briefly spoken to by the referee, mystifyingly. The only sanction was a free-kick. There was just enough time for Allan Clarke to fire in a shot that rattled Bonetti’s crossbar as Leeds struck the woodwork for the third time before the end was signalled and thirty minutes extra-time was to be played. With players now running on empty, it’s was hardly surprisingly that an Osgood header on the far post that flew wide was the only chance worthy of mention. The game ended in a draw and for the first time since Wembley had been opened, a replay would be required. With Leeds scheduled to travel to Scotland on 15th April to play the second leg of their European Cup semi-final against Celtic, there would be an inordinately long break between the initial game and the replay scheduled for Old Trafford in Manchester. Revie’s men had lost the home leg of the semi-final to a first minute goal by George Connelly, and surely needed to score early in the return if they were to redeem their chances. An early strike by Bremner inside the first quarter-hour offered hope, but goals from John Hughes and Bobby Murdoch just after the break eliminated Leeds from the competition. It meant that after finishing as runners-up in the league and being knocked out of the League Cup – ironically by Chelsea – losing out in Europe meant that the FA Cup was now the only hope of silverware for Revie’s team. However high the stakes were in the first game, they were now higher. Most pundits agreed that Leeds had been the better side in the first game, and with Gray dominating Webb on the Yorkshire club’s left flank, only an outstanding display by Bonetti and the woodwork had denied them victory. Chelsea manager Dave Sexton later revealed he knew he had to nullify the threat of Gray for the second game if his team were to have a better chance of coming out on top. He related that on the bus from the game, he spoke to Webb and told him that he would be swopping position with Harris for the second game. Webb would partner Dempsey in the middle of the Chelsea defence, with Harris detailed to nullify Harris. It was the sort of task the rugged defender had made a career out of. If the first game was considered to be rough, the replay took that to a whole new level. To illustrate the level of play in what has become known as one of the most notorious games in English domestic football history, David Ellery, at the time considered one of the country’s top officials, watched a replay of the game and concluded that the teams should have received six red and no less than 20 yellow cards between them. Some would consider that Mr Ellery often strayed towards the dramatic, but should you consider his assessment an outlandish exaggeration, take time to look at one of the YouTube replays of the game and draw your own conclusions. Early on, Ron Harris did what Ron Harris does. Charged with nullifying the threat of Gray, he carried out his brief with a kick on the back of the Scot’s leg that virtually immobilised him for the remainder of the game. This wasn’t a one-sided affair though. Jack Charlton both head-butted and kneed Chelsea striker Osgood, and following a deep cross, Jones bundled Bonetti into the net, a knee from the striker causing most damage. The latter occasion left the goalkeeper limping, and fairly helpless to stop a powerful shot from the same player a few minutes later after a scything run by Clarke had opened up Chelsea’s defence. With ten minutes to go until the break, for the third time in the encounter, Leeds were ahead. Chelsea were clearly angered by the situation. A rap across Gray’s knee by Harris reinforced the point, and from that point forward things deteriorated. Eric Jennings, refereeing the game, as he had done at Wembley, seemed determined to bring a laissez-faire approach to officiating and any measure of control of the game was fairly tenuous. Feeling the mood of the official, players freely indulged themselves in skulduggery as they saw fit. Hunter and Hutchinson squared up and exchanged blows, whilst Chelsea left-back McCreadie floored Bremner with a kung-fu style kick and Giles reprised his Wembley assault on Hollins, but this time more freely at different players. It wasn’t the wild west, after all there was no Sheriff, but even in the thud and blunder of the football of the day, it was pretty rough-house fare. Across the piece, Jennings awarded a total of 46 free-kicks against the teams, and probably missed the same number again. Despite the mayhem, not a single players was cautioned by the official. Back with affairs concerning the ball, Leeds continued to dominate as Chelsea were compelled to sink deeper to protect their injured goalkeeper. Bonetti ploughed on heroically. Giles fired just wide of his post, then he plunged low to save from a raiding Terry Cooper, up from full-back. With a resilience not unlike the fabled Yorkshire grit of their opponents though, Chelsea hung on and gradually played their way back into the game. Parity of possession was little benefit though as they still trailed, and that’s how it stayed until a dozen minutes from time. Whilst Gray had dominated the first game and been considered as a key weapon for the second, his Scotland team-mate, Charlie Cooke had been relatively quiet by comparison, but now the little wingman took centre stage. Collecting the ball in midfield, he looked up and saw Osgood racing into space. With the deftest of passes, he caressed the ball to intersect with the striker’s run and a powerful diving header did the rest. David Harvey, replacing Sprake in goal for Leeds was powerless and Osgood entered the history books for scoring in all rounds of an FA Cup run. He celebrated in front of the adoring Chelsea fans as the game was pulled back into equality for the third time. Reflection after the goal centred on the absence of Charlton who would normally have been policing Osgood. The lanky defender though, instead of tracking the striker, had been seeking out Hutchinson to deliver retribution for a dead-leg delivered by the striker moments earlier. It was a loss of concentration and discipline that may well have cost his team victory, but fitted right into the spirit of the game. Late on it could have become even worse. Osgood powered through a tiring Leeds defence, shattered by multiple cup runs and a tiring league programme, squared the ball to Hutchinson, but faced with the moment of destiny, he fired wide into the side netting as Harvey advanced to close him down. Then, Leeds had a half-chance. Lorimer crossed, but it was too deep for Jones to get a header on target and the ball sailed high and wide. It was extra-time again, and two tired teams drove their bruised and battered limbs forward again. With just 60 seconds remaining of the 15-minute period, Chelsea went ahead for the first time in 234 minutes of the encounter with their bitter rivals. Out on the left, Hutchinson hurled one of his long throws into the Leeds penalty area. Among a collision of goalkeeper, defender and forward at the near post, the ball was somehow flicked on towards the far end of the goal. With two Leeds players trying to clear, Dave Webb arrived like a missile and propelled the ball into the net. Some say it went in off his head, others claim it was the side of his face. Whatever the point of contact, the ball was in the net and after all that time of being behind, with barely 15 minutes to play, Chelsea were ahead. Leeds were now forced to gamble and throw players forward. As the second period ticked away, Chelsea sought to catch them on the break. Osgood broke with Hutchinson alongside him, driving into the Leeds half and faced by just two defenders. Jagging right then left, the striker pulled the defenders towards him before squaring for Hutchinson to tap into the net. Arms were raised in jubilation, but only briefly. In his ardour, the windmill-armed throwing striker had wondered into an offside position and Leeds breathed again. Replays were inconclusive, but it must have been a tight decision. Charlton had now forsaken defensive duties, not in search of retribution, but to settle scores in a more acceptable manner. A series of high balls floated into the Chelsea area were aimed for the big man, but between them, the more diminutive Webb and Dempsey coped, and largely kept the barrage away from the injured Bonetti. Hopes dimmed as time ticked by without any meaningful strike on goal. A final goal-kick hoisted into midfield by Dempsey, deputising in kicking duties for his troubled ‘keeper saw referee Jennings blow the final whistle and end one of the most controversial, absorbing and pulsating games of the modern era. (This All Blue Daze article was originally produced for the ‘These Football Times’ website).